﻿A few of the furry, feathered, and scaly residents who call Blackberry Creek home. Bob is as sweet as they come! He and his lifetime donkey love, Sophie, were at risk of being separated when their previous owners divorced and sold their home and land. Moving where they couldn't keep animals, the owners asked if we would care for Bob and Sophie. Of course we said yes! Twenty year old Bob is extremely intelligent, helpful, and affectionate. He loves to help with chores by trimming weeds, treading smooth trails through the sanctuary, and even holding our gloves while we mend the fence! 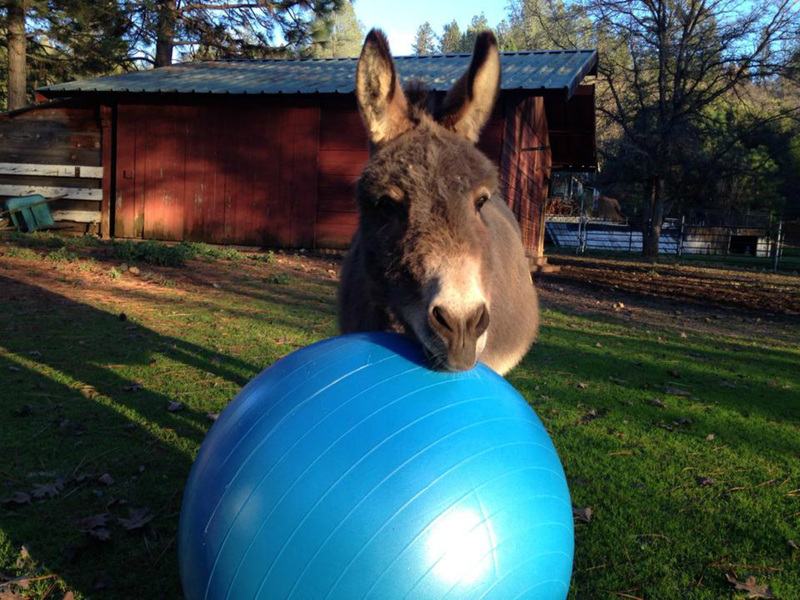 Bob's favorite pastimes include eating carrots and apples, playing with his "Jollyball" in the yard, and hanging out with Sophie in the pasture. Po was rescued in the spring from absolutely deplorable conditions at a family farm in Washington. The windowless barn he lived in had a foot of mud, manure, and debris on the floor and dead bodies of adult pigs and piglets littered the space around the living. Now Po is safe and will live the rest of his life in peace. Though he has some medical issues, he will receive the best care to make him mobile and comfortable. It was in the 30's the week he arrived and likely for the first time ever, Po had a barn of soft warm straw to snuggle up in. He got a bedtime cookie and was snoring within minutes. We love you Po. Welcome home. Ben Franklin loves to show off his feathers and parade around to impress whoever happens to be watching. He escaped death from a backyard butcher when he was confiscated by police during a drug raid. He was then given over to Fish and Game who thought he was a wild turkey and planned to put him down. Luckily, he was proven to be domestic and sent to a local animal shelter before coming home to live in peace at Blackberry Creek. Blossom and her sister were being raised by farmhands for their own dinner table at an egg and vegetable farm in Vacaville. A friend of the owner came to volunteer for the summer and found Blossom alone and mourning the loss of her sister who had been slaughtered first. The woman began talking to her through the fence and eventually spent her lunch break with her, reading aloud from her novel and sharing sandwiches. She eventually developed such a bond with her that she made it her personal mission to convince the farmhand to surrender her to a sanctuary. This feisty lady pig (half boar and half Yorkshire White) was named Blossom because her human friend realized that love could blossom even in the most unlikely of places! Oscar is a baby Sulcata tortoise who was found huddled in his shell on a cold night under our garbage can (hence his name). Oscar's previous owner kept him in a small outdoor enclosure in his backyard with other tortoises, dogs, and lots and lots of garbage. When a dog broke through his fence, Oscar escaped and wandered the neighborhood trying to find shelter. We drove him immediately to the vet who hydrated him, took a blood sample, and informed us of how to care for him properly. As an African Desert Tortoise, Oscar must stay warm and toasty and wouldn't have survived many cold nights out on his own. He now has a comfy indoor terrarium, a bird-proof outdoor enclosure, and all of the mulberry leaves and dandelion greens he can eat. His favorite treats are strawberries and zucchini, and he enjoys sleeping, soaking in a warm bath, and having his head and chin scratched. With our love and care, Oscar will likely grow to over 100 pounds and live to be between 100 and 150 years old! Ethel was one of over a thousand chickens rescued from a battery cage egg factory. She spent the first eighteen months of her life in a tiny cage where she could barely turn around, lost most of her feathers, and never saw daylight. She is now healthy and happy, taking dust baths, exploring the nearby creek, and snacking on bugs in the sunshine. Click here to learn about the horrible conditions of the battery cage egg industry from which Ethel was rescued. Pumpkin is the sweetest turkey you will ever meet! Originally intended to be a family's Thanksgiving dinner, she has given us much to be thankful for here at the sanctuary. She is gentle and kind, following people around the barnyard on their daily chores and eating from their hands. Sadly, Pumpkin is a Broad Breasted Bronze turkey - a turkey specially bred to get very large very fast so humans can eat them for meat. Because of her extremely rapid growth, Pumpkin's bones could not easily keep up with her weight gain and she struggles with leg issues and may later deal with heart problems. These birds have incredibly short lifespans ranging from only 9 months to a year or two compared with their wild counterparts who live to be around ten years old. 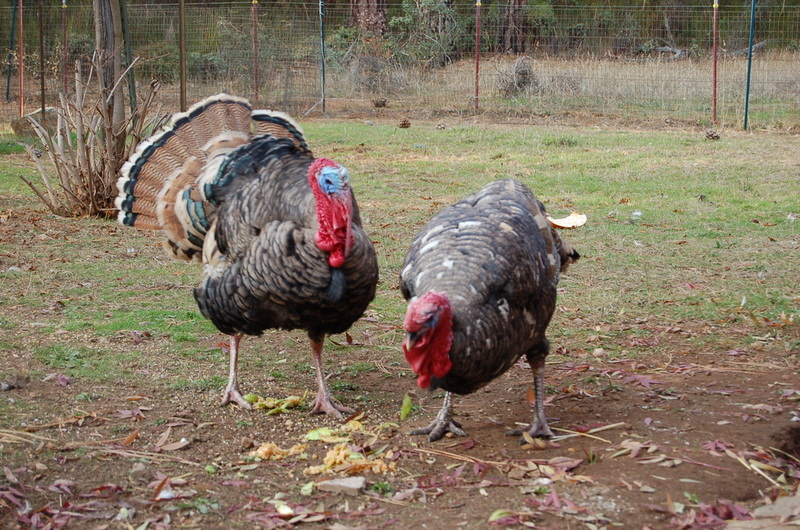 Please leave turkey off your plate and help birds like Pumpkin to be viewed as someone and not something. In early spring, a mother ewe gave birth to two tiny twins on a family farm. With the strain of a double pregnancy and childbirth, her uterus prolapsed and her owners decided to euthanize as the surgery to try to save her was unaffordable for them. The babies were able to know the sweet love of their mama for a short time before she had to leave them. They were immediately taken in by Blackberry Creek and will now get to remain together for life. We will tell them they are special and loved and important and strive to make their mama proud. Eugene is a Polish rooster who was dropped off at the animal shelter when a kind soul found him wandering by the side of the road alone. Like many roosters who are misidentified as baby girl chicks, he escaped death at an egg hatchery and again when he was dumped to fend for himself by people who did not find him a proper home. He came to us in February of 2015 after living in a cage at the shelter for over a month. Eugene is named after Gene Simmons with his eccentric hair and enjoys life in the "Bachelor Pad" a place reserved for roosters and male turkeys at the sanctuary! Mrs. Puff was born without eyes and sent to the local feed store in a shipment of baby chicks. The pecking for food movement is not instinctive and is usally taught by the mother at birth. Because Mrs. Puff (and all of the babies) are hatched from incubators, they do not ever get to experience their mothers' love and she was not learning how to eat. The feed store surrendered her, along with another chick she had bonded with, to us to try to save her life. For two months we did round the clock feedings through a syringe for this little love until finally, one day she started eating on her own! Tragically, many sickly or deformed chicks are used as "packing material" in boxes sent to feed stores, to cushion the healthy chicks during shipment. Mrs. Puff is a perfect example of how well special needs animals can do when given the love and care they need. While Grover was inside his mother's tummy, she was loaded onto a truck and driven down a busy freeway toward a slaughterhouse. Knowing the time was drawing near to have her babies, she heroically broke free from her crate and jumped off the speeding truck and onto the shoulder of the road. The brave mother, later named Rita, gave birth to fourteen tiny piglets at the animal control facility. Nine of the fourteen survived and all were taken in by Animal Place in Grass Valley so they could remain safely in sanctuary with their mother, something most piglets never experience. Once weaned from their mother, Grover and his two brothers came to live permanently in safety at Blackberry Creek. Grover acts like the big brother of the group and is the most independent of the three piglets, often taking charge and leading the others to the best rooting sports around the pasture. Can you imagine coming home from work and seeing two sheep swimming in your suburban backyard swimming pool? That is exactly what happened to the people who found Sherman "sheep paddling" in their backyard! Sherman was rescued by Animal Control (his friend escaped in the chaos) and brought to the local pound. He spent weeks watching the dogs at the shelter have temperment tests and play in the sunshine from the confines of his kennel, and had no other farm friends to keep him company. Luckily for Sherman a compassionate volunteer intervened and saved Sherman from being put up for adoption (and likely becoming someone's dinner). She found him a home at Blackberry Creek where he fit right in with our sheep and goat family! Shortly after rescuing Bert, we got another call about a llama in Sacramento who was lonely and neglected. A compassionate woman saw him every day on her drive to work, and finally decided to track down his owner and see if she could save him. What she found out was saddening. The owner had purchased two llamas years ago to be "sires" for breeding baby llamas. He later decided to board horses on his land instead, and sold one of the two llamas. The other llama, whom we later named Ernie, had been left on the property with food, but no medical care, no llama friends, and very little shade for six years. He had NEVER been sheared. The owner refused to give him up, until the concerned woman finally offered to buy his freedom .By the time we got him to Blackberry Creek, we were well aware Ernie was absolutely terrified of people and had not been treated with kindness. Our large animal veterinarian, Natalie Drost, said Ernie was the worst llama case she had ever seen and had most certainly never been seen by a vet or provided adequate care. He has since been sheared, vaccinated, dewormed, united with his buddy Bert, and is finally taking food from our hands. He is a living symbol of hope that those who have been hurt and neglected can learn to trust again! Huckleberry and his twin brother Sunshine arrived at the sanctuary in early March after losing their mother shortly after birth. This sweet little baby is growing strong and playful and will only every know safety within the walls of the sanctuary. He is an ambassador for millions of lambs slaughtered annually around the world and will teach visitors the importance of protecting the innocent and vulnerable. Pitty Pat was trapped as a feral kitten by an organization that seeks to help stray cats. She was taken to a local shelter where she was spayed, vaccinated, and given a health exam. She's an outdoorsy lady who mostly likes to stay away from people, but she graces volunteers with her presence in the barn on occasion or surprises guests by staring down at them from the top of a sanctuary tree. Though she's not one for affection from humans, she adores snuggling with Roscoe in the barn on chilly nights. Camilla was named after the famous Muppet chicken, and came to us under the strangest of circumstances. She was brought, nervous and wrapped up in a box, to a Christmas party as a White Elephant Gift because someone thought it would be funny. The winner took her home to play practical jokes on his brother, but luckily, we were able to get him to bring her to us, to live with other hens at the sanctuary! Sophie is a beautiful miniature donkey who is about nineteen years old. She lives at the sanctuary with Bob and hates to be separated from him for any reason. When we groom Bob we have to make sure Sophie goes with him or she becomes incredibly distressed! She is sweet and shy, and though it has taken us several months to earn her trust, she now lets us give her kisses and put on her raincoat when a storm rolls in. She and Bob experienced the pain of losing two babies in their younger years, one due to bitter winter cold and another when it was sold and taken away from them. We have promised Sophie to keep her and Bob together and to care for them at the sanctuary for the rest of their lives. Eloise's upper beak was lasered off as a tiny chick when she was just severl days old at the egg factory. This standard practice makes it difficult for hens to peck each other and themselves due to stress in the immensly crowded and filthy conditions of the battery cages. 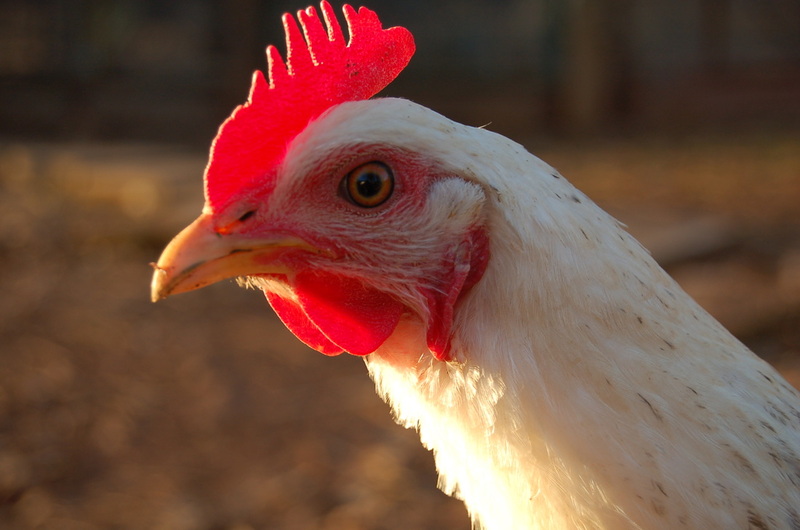 Her disability doesn't stop her from loving life after the egg industry at Blackberry Creek where she now gets to practice normal behaviors like pecking for seeds, wading in the creek, and dustbathing. She is a playful and sweet hen loved by the other chickens and her human friends. 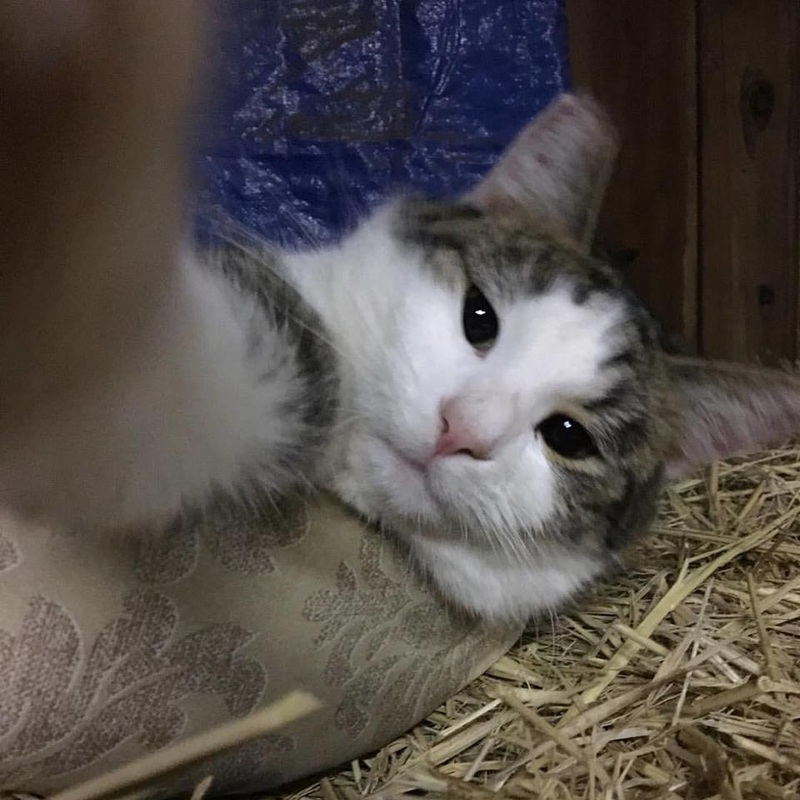 This is Roscoe, the barn cat, who came to live at Blackberry Creek last summer with his friend Pitty Pat, when he was declared by an animal shelter too feral to be an indoor fellow. So far, we think he may have been less than truthful with the kind people at the shelter, as he is one of the most affectionate cats who ever lived. We call him "catdog" because he follows the caretakers on morning and evening chores every day. Felix was purchased as a baby chick by a woman who has backyard chickens. The hatcheries which supply feed stores with baby chicks are nearly always the same ones that supply the egg industry. This means that when chicks are born they are immediately "sexed" to determine which gender they are. The girls get funneled into the egg industry and a few head to feed stores where they are purchased by individuals for eggs or meat. Since the boys are not "meat birds" (genetically engineered to grow to enormous size for slaughter in six weeks) they are killed in "economic" ways such as being ground alive or suffocated. By happy accident, this boy was determined to be a girl as a baby chick and avoided death! Once he started to grow up, his owner realized he was a rooster. Felix's owner hadn't even named him because she was quite attached to the little guy and couldn't bare the thought of him being killed for human consumption. Once she found Blackberry Creek and knew he would be safe, she and her family named him Felix which means "fortunate.". This little love is Forrest. Stolen from his mother at birth so that humans could drink her milk and eat her cheese, he was completely emaciated at three days old. The veterinarian noticed his gums and lips were bruised from trying to suckle the wire cage he was in after birth. After being purchased at a dairy auction at a day old, Forrest was thrown in the back of a man's truck who attempted to sell him, along with fifty other baby goats, for meat. The man picked the babies up by their legs and necks, tossing them into wire crates. Luckily, Forrest was saved and brought to Blackberry Creek Farm Animal Sanctuary where he arrived with his barcode still on, proof that he was considered a product rather than a tiny soul. He walked awkwardly on his toes (hence his name, Forrest!) and has received physical therapy to help lengthen his tendons. After extensive local veterinary care, he spent a week at UC Davis fighting for his life with his best friend, Gerald. Tragically, Forrest had to watch as Gerald slipped away due to septic infection as his body, lacking colostrum from his mother, had no immunity whatsoever. Forrest is back home and continues to recover slowly, though he misses his friend. This is Forrest, a survivor of the dairy industry. Sir Smudgecake is a very fortunate piglet whose life nearly met a tragic end. While his mother, Rita, was pregnant with him and his siblings, she was loaded into a truck headed for slaughter. While speeding down the freeway, she broke free and made a heroic leap, saving not only her own life, but that of her nine unborn piglets. Rita gave birth at a shelter and was taken in permanently by Animal Place. 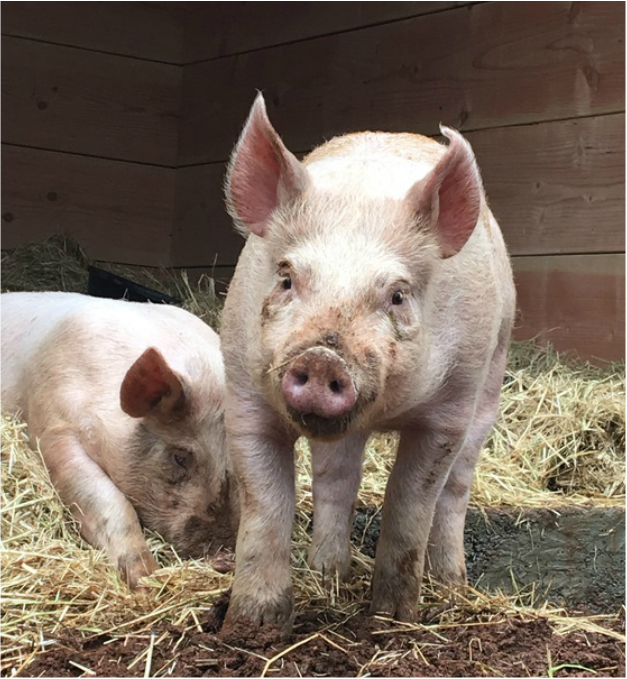 Smudgecake and his brother, adopted by Blackberry Creek Farm Animal Sanctuary, will only ever know a life of kindness and love from humans, something most pigs never experience in their short six months on earth before being slaughtered. These piglets will meet thousands of visitors in their lifetimes and be ambassadors for all animals society has commoditized, encouraging people everywhere to remember that they are individuals with thoughts, feelings, and the desire to live. In March animal control officers conducted an extensive investigation of a family farm in Washington, and what they found was horrifying. Thirteen farm pigs and one potbelly were living in absolute filth and experiencing unimaginable cruelty. When officers arrived, the animals were being housed in a dark, windowless barn, filled with nearly a foot of feces, mud, and debris. Dead bodies of adult pigs and piglets were visible all throughout the barn and across the property, some lying deceased next to their still-living friends. ​For a long while, the pigs were forced to watch their family members being slaughtered right in front of their eyes, and pregnant mother pigs who were killed had their fetuses fed to the potbelly as his only source of nourishment. The smells of blood and death were heavy in the air. There was no food or water present during the time of the investigation and horses and dogs were also seized from the property. Many of the pigs had severe injuries or mobility issues and some could barely walk. All were immediately removed and a nationwide plea went out for sanctuaries to save these pigs from facing a second terrible fate; farmers who wanted to slaughter them at the fairgrounds or euthanasia due to mobility issues. Two of the rescued females gave birth immediately upon rescue (one in the back of the transport truck) adding to the difficulty of placing these deserving animals. In the nick of time, three sanctuaries who already had their hands and barns full of pigs, stepped up to save their lives. PigsPeace in Washington, Animal Place in Grass Valley, along with us here at Blackberry Creek, welcomed these deserving souls into our sanctuaries. It will be a long road ahead and we are all depending on our extraordinary volunteers and donors to provide in an extraordinary way for these brave pigs. Though they face many health challenges and emotional struggles, Percival and Po will never again know cruelty or neglect. They will know only peace. They will know only joy. They will know only compassion. Here's to many years rooting through the woods, wading in the cool water of Blackberry Creek, and making up for lost time knowing kindness and love. Llarry's mother, Winifred, was surrendered at a Central California shelter along with her herd after her owners could not properly care for them. We rescued her along with Violet in the summer of 2016 and little did we know we were bringing Llarry home too! Winnie was pregnant with this precious baby boy, the first healthy baby to be born at Blackberry Creek! He is adored by everyone at the sanctuary especially his mama and his Auntie Violet, both of whom are excellent caretakers. Unlike so many billions of animals in the US, Llarry will only ever know peace and kindness from humans. Mo was born to a farmer who raised pigs for meat. His mama was only nine months old when she gave birth to him and had her babies too near to a pond. They all drowned except for Mo, whom she then rejected and would not let nurse. What seemed like a tragedy for baby Mo actually saved his life. The farmer, not wanting to bottle feed Mo, gave him away, and he ended up finding a loving home in sanctuary. Mo hit the piglet lottery by avoiding the fate of more than 115 million pigs who are killed each year for food. Take the "No Mo' Meat" challenge and switch to a plant-based diet to stand in solidarity with Mo and innocent animals everywhere. If you accept the "No Mo' Meat" challenge, let us know by using the hashtag #nomomeat on social media! After being homeless on the streets of Taiwan, George was saved by a rescue group, treated for heartworm, and bravely made a long flight across the Pacific Ocean to the San Francisco Airport where he was adopted by the co-founders of Blackberry Creek. The veterinarian who treats him in the US believes that he lost his back leg in a trap which he tried to chew out of, breaking off both of his bottom canine teeth. George now has a cozy bed, a loving famiy, a dog friend, and will only know love and joy for the rest of his life. He visits an elderly home and inspires those who have disabilities with his courage and gentle heart. Sweetheart arrived at the sanctuary the weekend of Valentine's Day and stole our hearts right away. She was dumped at a feed store with a terrible injury to her right leg and foot. The toes were beginning to turn black and the hip to dislocate from walking with her leg splayed according to an avian specialist. A wonderful veterinarian specializing in avian health performed surgery to remove her leg right above her right knee joint. She is currently healing beautifully and living in the house as she recovers. Our co founder is a computer science teacher and will be helping his students to print her a prostethic leg so that she can enjoy normal chicken activities outdoors! Violet is a South America cousin of the llama called a guanaco. She was surrendered at the pound when her owners could not take proper care of her. Violet is kind and gentle and has beautiful, soulful eyes. When she arrived at Blackberry Creek she was several months pregnant, but because her gestation period is 11 months and because she gained weight after having proper nutrition, our vet did not detect the pregnancy. She gave birth to a stillborn baby girl, Holly, around Christmas time and suffered from a prolapsed uterus. Our veterinarian worked quickly to save her life and she has since made a full recovery. Though she refused to eat and mourned her baby for about a week, she is now the proud and doting aunt of Baby Llarry Pepperpants. Nutmeg the turkey is a sweet and gentle soul. Raised in the home of a backyard butcher, she suffered a severe infection as a chick that wasn't treated with antibiotics (a fate that befalls many animals raised for "organic" meat). The illness ravaged her sinuses and left her blind in one eye. She is a beloved friend of Pumpkin the turkey, loves being petted, and since being rescued, enjoys a life of freedom that most turkeys never experience. 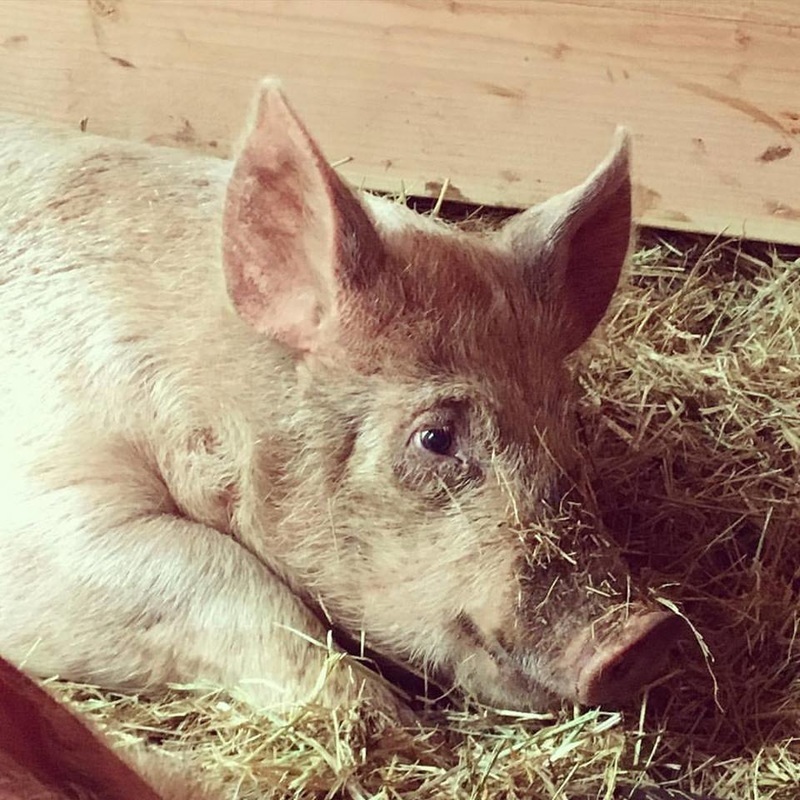 Named after animal-rights activist and star of the motion picture "Babe", James Cromwell, Cromwell the pig lives up to the kindness of his namesake! Brother of Grover and Sir Andrew K Smudgecake, Crommy was one of the lucky piglets who survived in his mother's tummy as she made a heroic leap off of the back of a truck headed to slaughter. Cromwell is the most loving and affectionate of the pigs, flopping over for a tummy rub almost immediately when anyone enters the gate. 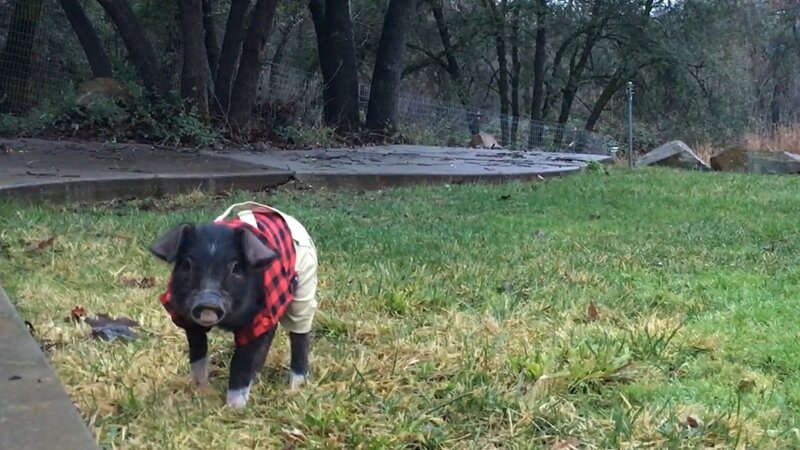 He is learning how to sit for his bedtime treats and will be an ambassador for pigs everywhere as he shares his lovable personality with visitors. Bandara was one of the hens who joined Blackberry Creek in the summer of 2016 after she was rescued from a free range, pasture based egg farm. Though conditions for her were much better than the battery cage egg factories from which most of our hens were liberated, she still would have been killed for pet food or fertilizer after her eighteen months was up if she had not been welcomed into sanctuary. Chickens normally live 7-10 years, but hens like Bandara, who are genetically modified to lay over 270 eggs a year have lmuch shorter lifespans because of the many medical issues they face.